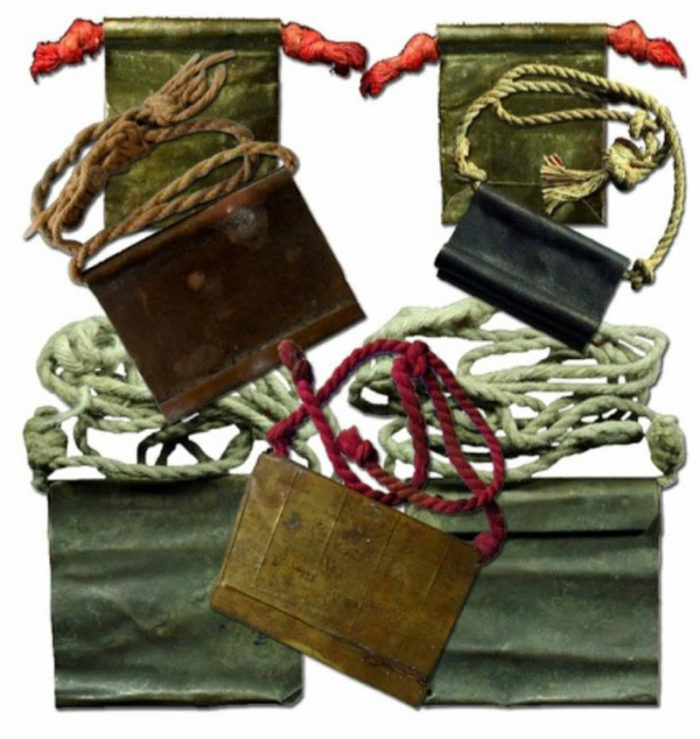 The Takrut is a form of Talisman or Amulet, which dates back for Centuries, and was originally popular as a Kong Grapan Chadtri and Klaew Klaad Protection amulet for Warriors. The Takrut, is in essence a Scroll Spell made using the Inscription of Sacred Geometry Design, Numerology, Pictorial Images, and Magical Khom Agkhara Lettering. The materials used for Takrut were and still are manyfold, and could be made of gold, silver, or bronze metallic foil, bamboo, wood, animal skin, or even parchment paper. 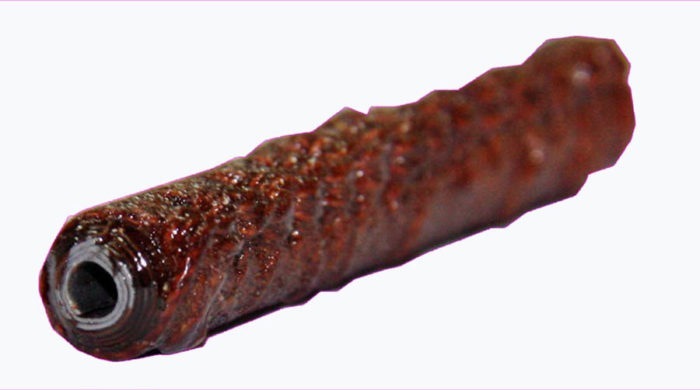 Some Takrut are not scrolls,and can be made from solid objects, such as a piece of wood, coral, or other sacred substance.Some were covered with cord wrapping and lacquered (Dtak Chueak Long Rak). 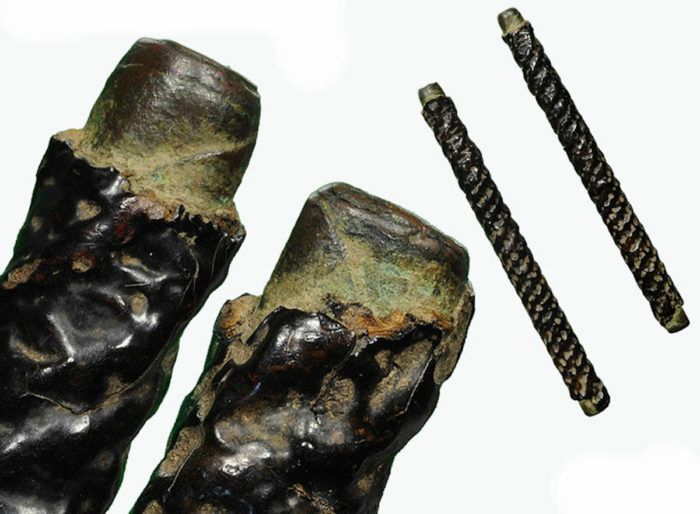 These scrolls would then either be worn by threading a cord through them (for in olden times there was no steel capped transparent tube or waterproof casing), and sometimes, inserted within a protective exterior. 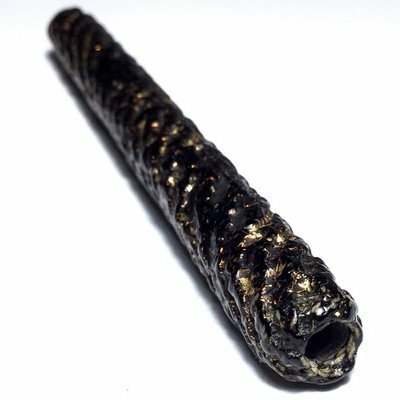 Some Takrut are also made from Sacred or Magical Substances, such as ‘Mai Phai Dtan’ Solid Bamboo Anomaly, or ‘Mai Phai Ruak’ ‘Scalded Bamboo’. Takrut are seen to be made using various animal parts such as Goose Bone, or Cordiceps Cicadas. Below; Takrut Paya Wan Jakkajan, by Ajarn Plien, Lay Master of Wat Don Sala in Pattalaung. 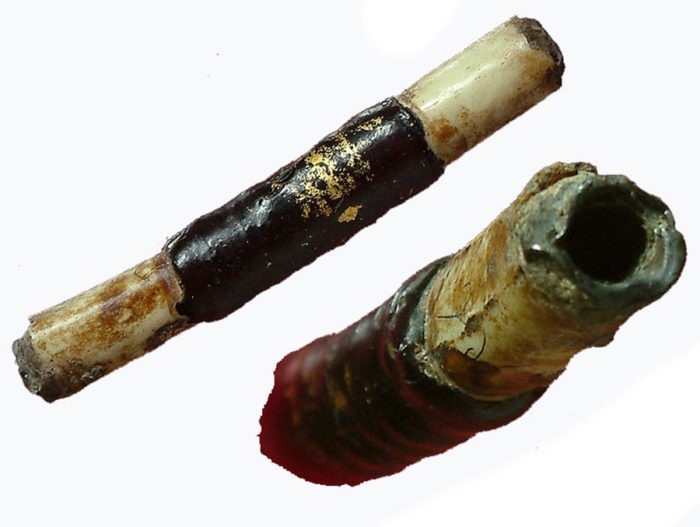 The ‘Takrut Graduk Haan’ Goose Bone Takrut is something that is very celebrated by the ‘Look Sit’ disciples of Luang Por Hrun in the particular ‘Wicha’ of ‘Kong Grapan Chadtri’ Invulnerablility. Disciples of LP Hrun that may live an alternative or dangerous lifestyle in areas such as gambling dens, massage parlors, police, military and even modern day gangsters would benefit from being the bearer of this protective charm. Luang Por’s first edition was released in 2460 BE, and is now over 100 Years old. Some Takrut are inserted within a metallic shell, and forged into various decorative shape frames, such as Naga Serpents, Dragons, and other Mythical Animals and Deities, such as Hanuman, Lersi, Garuda, Vishnu, Brahma and Ganesha. 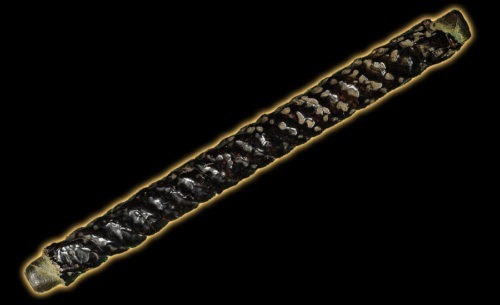 Some Takrut use very ancient methods of Alchemical Metallurgy, and are cast in their entirety as a metallic decorative hollow tube, which is also known then as ‘Takrut Hlor Boran’. 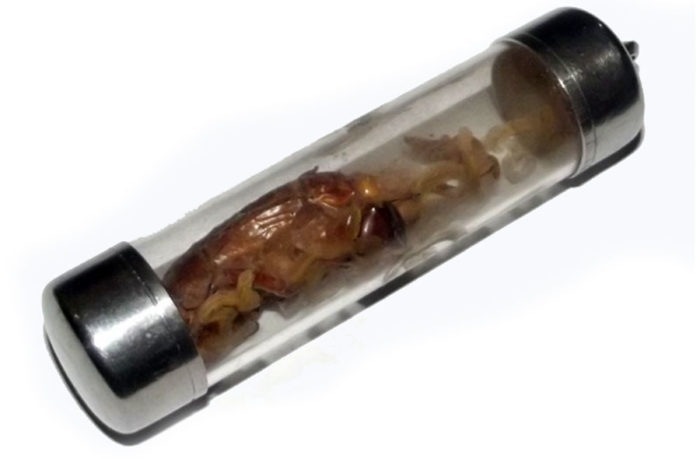 This kind of Takrut often is used by inserting a parchment scroll within the tube with one’s wishes and prayers. This is performed by inserting a piece of paper into the tubular fold of the Takrut with the name of person you wish to influence, or your special wish written upon it. Some people may also insert a piece of hair or nail clippings, or a piece of cloth taken from the bedclothes, pillow or clothing of the targeted person. ‘Takrut Hlor Boran’ means ‘Ancient Cast Metal Takrut’. Because Olden Days were full of Wars and different small Kingdoms battling with each other, it was most common to see Takrut made specifically for Kong Grapan Chadtri and Klaew Klaad Protection. 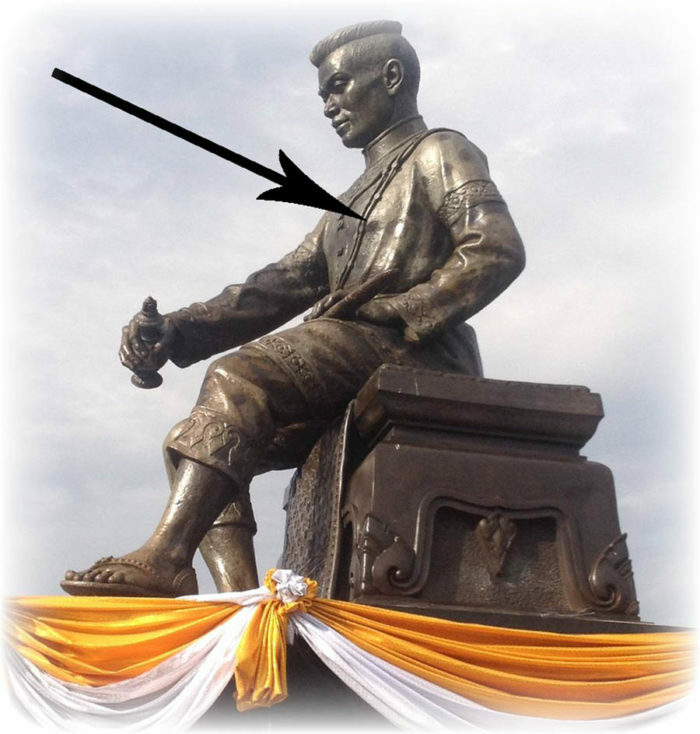 This can be seen to be highly evident if we admire the statue of King Naresuan Maharach at the Naresuan University, which is an image of Pra Naresuan Maha Rach (First King, and Founder of the Unified Kingdom of Siam/Thailand), who is sitting on a throne, and wears a chain of 16 Takrut Solos over his breast and back, as protective magical Armour. Nowadays, in times where less people have to go to War, and less local battles and local disputes have brought us into an Era where the problem is not the danger of War, or Deadly Enemies, rather, the New Problem is Economical. In these times where life is becoming ever more expensive and we are having to spend higher and higher sums to stay afloat, and where money is becoming ever harder to find, it is essential to get some luck and fortune to advance financially. Below; Takrut Pitsamorn Pork Krang Putsa, from Pra Ajarn Gorp Chai of Wat Mae Ya Temple in the Northern Province of Tak, released in the year 2559 BE, these Takrut are a continuation of the Dtamra of the Wicha of Luang Phu Ban of Wat Mae Ya and the Lanna Master Lineage of Kroo Ba Wang (Wat Ban Den). The Takrut Pitsamorn were made adhering to the traditional ancient methods of Wicha saiyasart Lanna for making the Takrut type talisman. 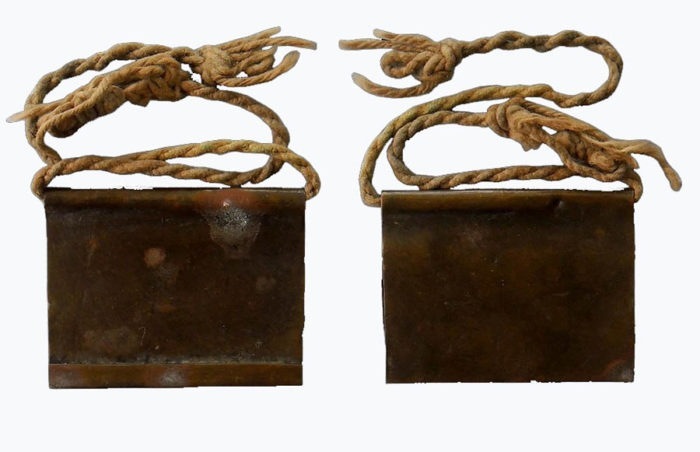 The Lanna method most often than not uses the Wicha Pitsamorn, which involves the use of three separate Yantra Foil inscriptions bound together with cord. The Takrut are inscribed with magic spells in Lanna Agkhara Sanskrit script, for Kong Grapan Chadtri invincibility, and Klaew Klaad evasion of danger. These Takrut have then been coated with Krang Putsa plum paste using hot flame to melt the past around the Takrut. The word ‘Krang’ alludes to the phrase ‘Krang Krai’ which means intense desire for somthing or somebody. Krang Putsa paste is believed to induce powerful magical attraction force into the amulets. 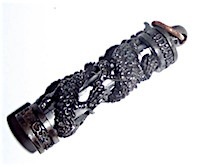 Tiger Takrut are used for Maha Amnaj Kong Grapan Chadtri Power and Protection. Those who are in positions of command or office, or who need to increase their status and influence over others, will be well served with this kind of Takrut. 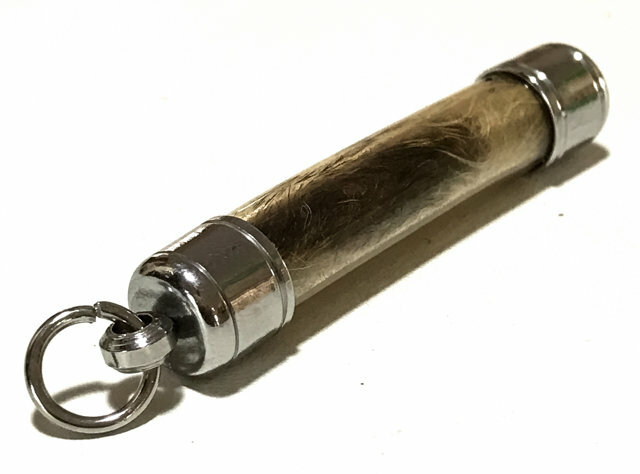 Those who wear Tiger Sak Yant Thai Temple Tattoos are especially recommended to use this kind of amulet, and to use Kata Suea and Kata for Sak Yant to empower both the Takrut and their tattoos. The most powerful part of the Tiger is considered to be the forehead Hnaa Bpaag), for its impermeability and for the foresight of the tiger to hunt its prey, and its ravery. These days, liberation comes with wealth, not with Martial Power. People need help with their Economies more than they need protection in War. Hence, the Modern Era has seen the Takrut to become ever more popular for Maha Pokasap, Metta Mahaniyom, Maha Lap, and Maha Sanaeh – which are all much more relevant for the present age. This Era requires more Metta Maha Niyom and Maha Sanaeh Maha Lap Maha Pokasap type amulets, for the needs of the current Generation. One of the most powerful and ancient traditions for Maha Sanaeh and Metta Maha Niyom Magic comes from the Northern Lanna Regions, where Powerful Animist Sorcery has been practiced for thousands opf years. Because of the need for more Maha Sanaeh and Metta Maha Niyom type amulets, and Maha Lap Maha Pokasap wealth increasing talismans, the Thai Lanna Wicha have become ever more popular in the present times, for they cater well for the current needs, with their ancient Seduction Spells and Binding Spells for Love, and Powerful Mercy Charms for God Busiiness and Popularity. The Takrut Joong Nang Khao Hong, by Kroo Ba Buddha of Wat Nong Bua is empowered for Pure Metta Maha Niyom, and Maha Sanaeh, for Seductive Attraction and Mercy Charm. ‘Joong Nang Khao Hong’ means ‘to take a lady by the hand and lead her into the bedroom’. 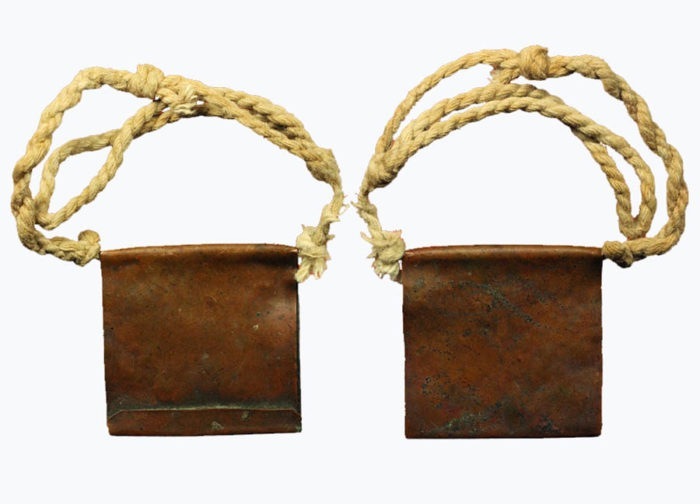 This explains the main purpose of this Takrut, which is intended to assist in amorous approaches, as well as for attracting customers and entourage. 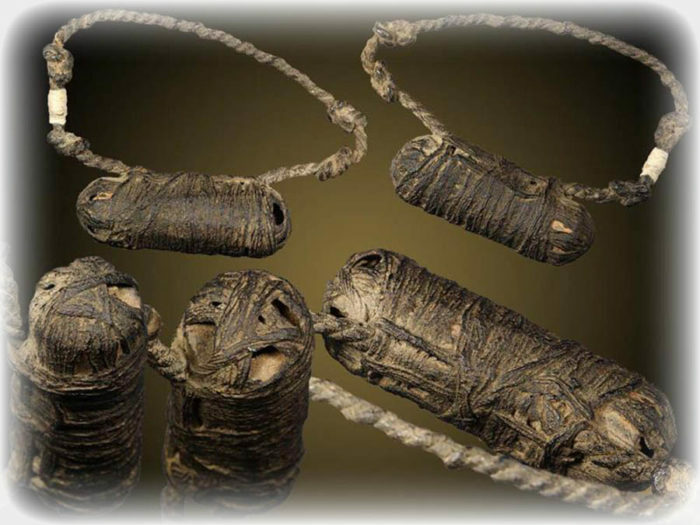 Some Takrut, are filled with Muan Sarn Sacred Powders or See Pheung Paste, to imbue special pheromonic and Necromantic properties to the amulet, especially for Romantic, and Nocturnal and Vice-Related activities, such as Gambling. The Takrut Bpaag Phii is a Necromantic amulet from Lanna Master, Pra Ajarn Dtecharangsri. This Pure Silver Takrut is filled with Prai Bone Powders with Prai Grasip Gambling Ghost Whisperer Power. The Ghost Whisperer (Prai Grasip) is a Magical effect that prewarns of lucky streaks or attractive tables or games to bet on, and will also warn of danger or when to flee. The powders of the bones of 56 Hoeng Prai Ghosts were ground up and invoked with reanimation spells to invoke a resident spirit within each Takrut. The Takrut Yant Hneeb is a Traditional Lanna Wicha that is not found elswehere in the other regions of Thailand, except where a Master has brought the Wicha with him from the North. 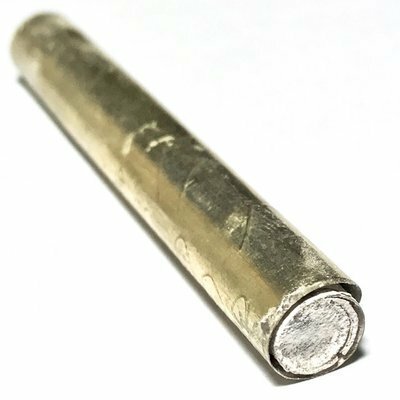 The Yant Hneeb is used to insert a piece of parchment or paper, with wishes or magic spells on to invoke one’s desired results. Takrut Yant Hneeb, are another kind of Lanna Yantra Spell that are not rolled into scrolls, rather, inscribed on a single rectangular foil, and folded flat facing inwards on each other. They are usually composed of a front side (Yant Pratab Hnaa) and a rear side spell (Yant Pratab Hlang), to seal the magical forces within and prevent them from either flowing out again, or from being destroyed from magic invasion from an exterior source. The Yant Hneeb, is a spell which encloses its target sealed within, and does not let it escape. 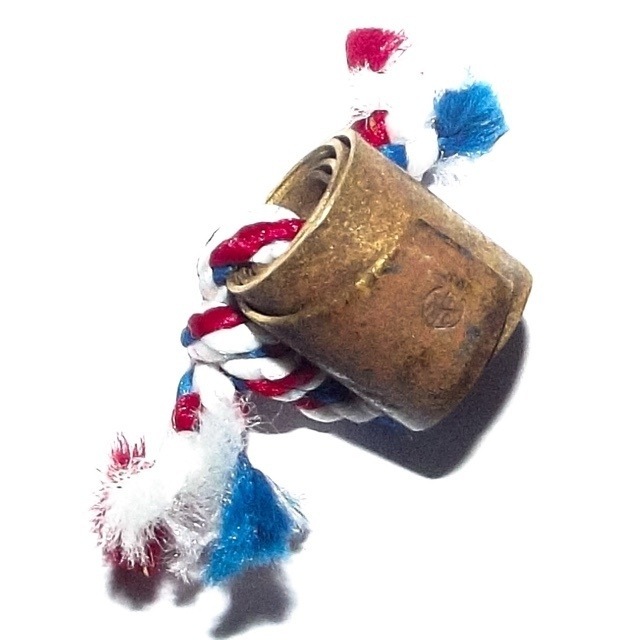 Some Yant Hneeb contain a spell that encloses an idea, such as the love of a desired person, and some Yant Hneeb, actually have something placed inside it, such as a piece of parchment or paper with the name of a person, or the desired thing which the user wishes to receive or achieve. Other things which may be enclosed within such a binding spell, may include the hair of a person, or a piece of their clothing, a photo, or other item. 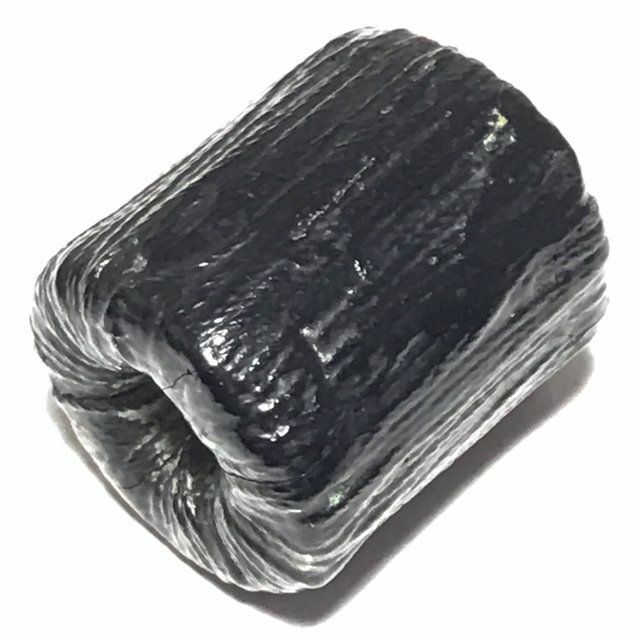 Yant Hneeb which do not contain any objects within, may target wealth accumulation, or protection from danger or black magic. Those which contain the name or personal items of a person, are of course intended to bind the person for love or seduction purposes. 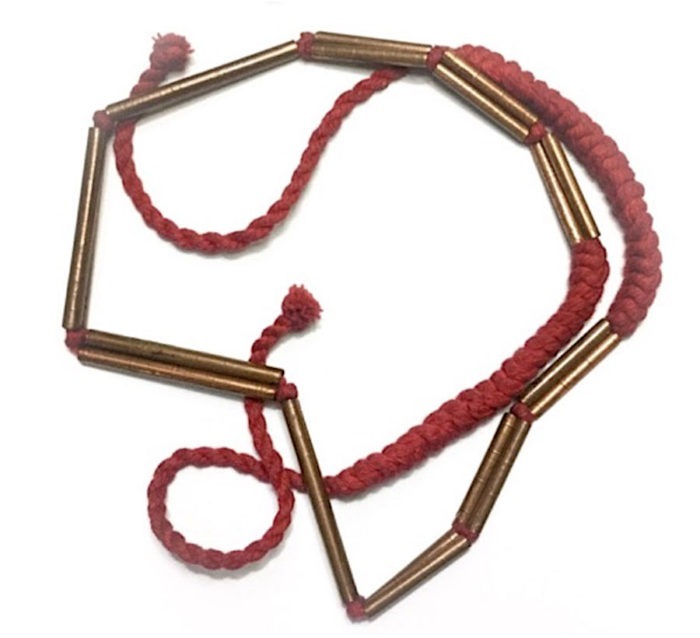 Yant Hneeb are usually attached to a piece of cord after being folded, which is passed through the ‘eye’ of the folded Yantra, and used to attach to one’s person or to hang in the desired place where the magic should perform its desired purpose. 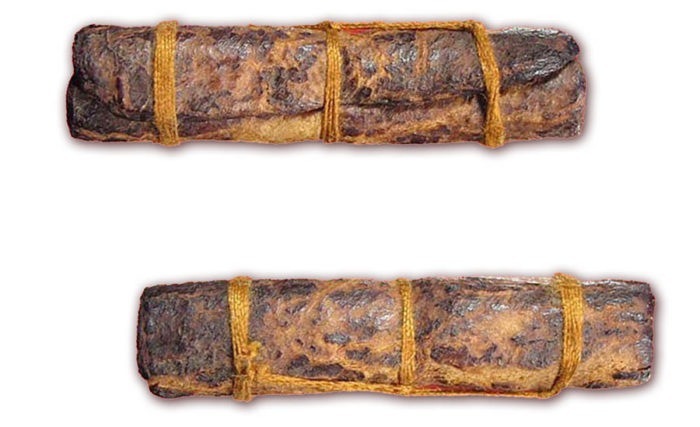 One other ancient form of Takrut of the Lanna People is the Takrut Hnang Kwai Pork Krang Putsa, which made from Hhnang Kway (buffalo skin), Inscribed with Agkhara Spells and Sacred Yant, and rolled into a scroll. 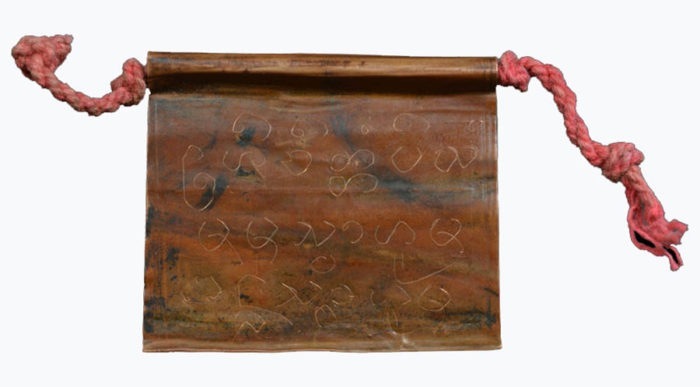 The above image of a Takrut Hnang Kwai Pork Krang Putsa, is a Sacred Yantra spell made on buffalo hide, coated in sacred resin, from Kroo Ba Chum, Lanna Master Monk. This Takrut is from around the year 2518 BE, and is an extremely rare acquisition. A Classic and Powerful piece of Thai Lanna Sorcery of Legendary Status. invocations and incantations, and rolled up, and bound to a cord for wearing as a protective Talisman, or to bring other magical effects. the bound hands of corpses in Funeral Ceremonies. 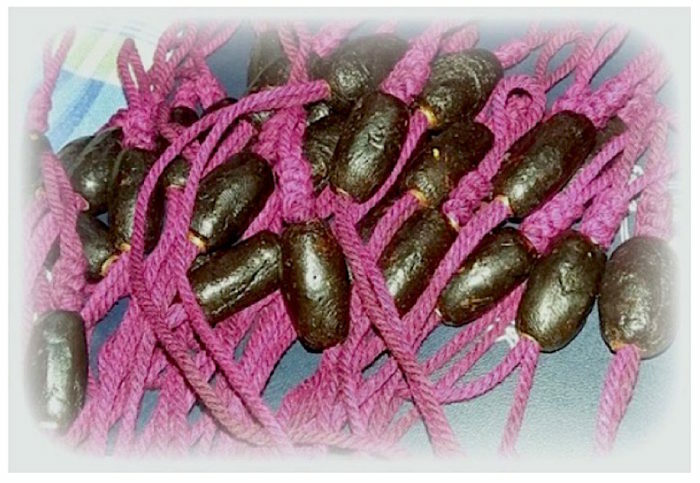 Another method is to use Sincana cords from the cord Yantra Spells which are bound to the ceilings in a net-like pattern, in the temples and Samnak Ruesi during Ritual Ceremonies. Different cords have different Magical Powers attributed to them. 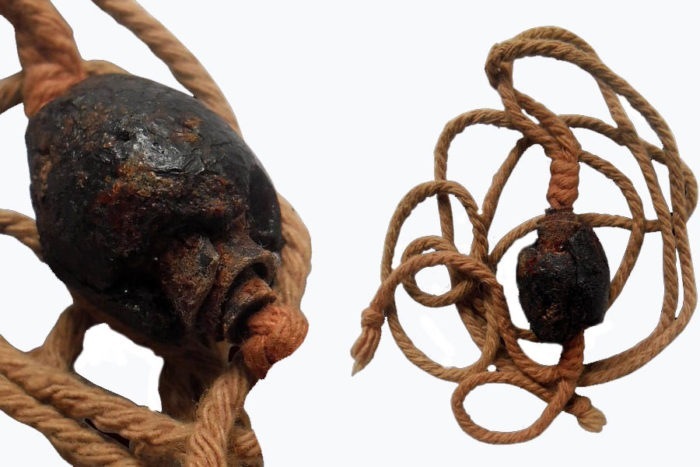 Cords are also used to bind multiple Takrut spells onto a cord necklace, which is called a ‘Takrut Sangwal’ or a waist cord called ‘Chueak Takrut Kart Aew’. The Takrut Bailan, is a classic and most beautiful form of Lanna Sorcery, made using a Magic Scroll Spell, diligently written upon the surface of Bailan Parchment. The traditional method uses a Hlek Jarn, which is a sharp instrument for inscription, which is used to scratch the inscriptions onto the surface of the parchment. As is the case with all Magical Inscriptions using Sacred Agkhara Lanna, Incantations must always be performed during and after the inscription of the spells. There seems to have been no fixed particular method for the Wicha to make Takrut Bailan Lanna, as it is seen that each different Master and Samnak, developed their own idiosyncrasies and methods which cause each type of Kruean Rang to differ slightly in appearance. The above Takrut is a very rare example of the legendary Takrut Pitsamorn Lek of Luang Phu Rian, Gaeji Ajarn Master Monk of Wat Bang Rahoeng, in Nontaburi. The Takrut Pitsamorn is famous for Klaew Klaad Kong Grapan Chadtri Maha Ud and Pokasap Power, and is one of the eminent and world famous members of the Tamniab Pra Niyom of the Samakom Pra Krieang Thai, in the category of Krueang Rang Talismanic Charms, and the Category of Nontaburi Master Monk amulets. Each Master makes and empowers their Takrut Bailan slightly differently according to bis lineage, but the basic empowerment and materials are usually similar in their basic compositional formulas based on lineage. Once the basic requirements are fulfilled, each Master then tends to digress thereafter, as he adds his own personal touch to the Wicha. This is the result of a development process, as the Masters applied their discoveries and personal attainments to the Wicha, which has resulted in a proliferation of forms in the present day.